Today I watched Harold and Maude, and learned that Manic Pixie Dream Girls never really grow out of it. Harold is a death-obsessed guy in his 20s who tries to get his mother's attention with elaborately staged suicides. He drives a hearse. He attends funerals for fun. It is at one of these funerals that he meets the 79 year-old Maude and begins a friendship with her. If you've read the plot summary of even one MPDG film, you know the rest by now - she teaches him to love life and embrace its possibilities and fall in love and blah blah blah. Yesterday, I mentioned that my problem with Garden State is that it doesn't earn its quirk. To H&M's credit, it does earn the quirk. All of its characters are kooky, but they inhabit a film world where they are not out of place. If this had been a May-December romance set in that world, I may have even liked it. But there are two big problems with Harold and Maude: Harold and Maude. I know that the point of a movie is not to make you love everybody in it, and that movies often ask you to identify with truly awful people. Take one of my favorite movies of the last year, The Town. Ben Affleck plays a bank robbing murderer, but you still want him to get away and get the girl. The movie is honest about what he is. Or my favorite TV show, Dexter. He's a serial killer! You still cheer when he foils attempts to bring him down, though. The thing that makes these character work is that their shows are honest about what they are. Where a movie loses me is when it presents a character doing lousy things but expects you just to write it off because it's cutesy. 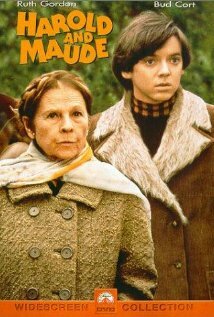 Harold and Maude are two of the most selfish characters in any movie I have ever seen, but rather than being called out for it or experiencing any kind of growth past it, you're supposed to think it's just adorable, because she's old and tiny, and speaks in platitudes. You know how they actually meet? She steals his car, and then offers him a ride. This is not a one-time occurrence. Whenever Maude needs a ride, she steals whichever vehicle is closest at hand. Her response when Harold mentions that this might not be the best thing to do: "Well, if some people get upset because they feel they have a hold on some things, I'm merely acting as a gentle reminder: here today, gone tomorrow, so don't get attached to things *now. * With *that* in mind, I'm not against collecting stuff." In other words, it's OK for me to take your things, but don't touch my things. That's pretty much the pattern for her character; what she calls "embracing life" is what the rest of the world would call "being a selfish, obnoxious pain to everybody around you." Somebody gives you a thoughtful gift? Throw it in the ocean so that you'll "always know where it is!" A cop asks for your driver's license? Tell him you "don't believe in them!" A person loves you and throws you a thoughtful birthday celebration to declare their love? Kill yourself with an overdose of drugs because you feel like you've lived as long as you want to live! Oops, I guess I spoiled the end. Anyway, my point is this - sure, you're entitled to live life to the fullest, and even to do that by acting in the most self-centered way that you like. What the writers and directors of MPDG movies expect us to believe again and again, though, is that somebody who does live that way will still be surrounded by people who instantly fall in love with them, and that just isn't the case. Or as Roger Ebert puts it, "And so what we get, finally, is a movie of attitudes. Harold is death, Maude life, and they manage to make the two seem so similar that life's hardly worth the extra bother." I'm three movies into the Manic Pixie Dream Girls block, with just one left to go, and I'm definitely ready to move on to the next thing. Watching this many in a row has given me a new revelation about MPDGs, though. They are almost never a permanent fixture in the male romantic interest's life. Once they have imparted their lessons, they either die or leave. If they are in for the long haul, then they are a hothouse flower who must be treated as a precious and delicate thing. RATING - One Jaguar hearse out of five. With all love and respect, I think you're missing a key piece of context for Harold & Maude, in the scene where he offers her a ring and she tosses it immediately in the water - romantically. This is when he sees the number tattooed on her arm from the Concentration Camps. It's such a brief, beautifully understated moment by Hal Ashby; it's just whisked away. I still think it would be a wonderful movie without it, but it deepens her character considerably: she has lost a shitload of people, she has nothing left but old belongings, said goodbye to everyone. She has seen the absolute worst in people, but instead of falling into that blackness, she decides to turn toward whimsy. Now, perhaps she is in denial, some would say, and the movie certainly masks what a pest she's being (its hippy strains, perhaps), but I do think there is a willful way she is trying to drive herself forward with her quirks. And I do think she comes alive when she meets Harold. Certainly not as much as he does, but she finds a good recepticle in him to pass on what she feels is a positive message: to live. He is dwelling on death, probably to an unreasonable degree (he's wealthy, young, vibrant...), and she is able to teach him to enjoy what he is able to enjoy. So, when she kills herself, perhaps it is a selfish act; but she is paying tribute, rather, to the ghosts of her past. Harold has helped release her, in a sense, and fortunately in his whipping car ride back home, he is able to recognize that she will be for him what so many others were for her - those who disappeared, but always remained, in the heart. Don't forget, too, the whole Vietnam-recruitment shenanigans. This is 1971, when a lot of loved sons and friends were coming home in coffins. You make very thoughtful points. I hadn't considered the angle of Harold also giving something back to her, in the form of a release, but that's a good point, as is the Vietnam-era context.